Lucas (Mads Mikkelson), a kind, caring and recently divorced nursery teacher, is well-liked by the community of a Danish town – teachers, children and their parents – and resolute in determination to win custody of his son Marcus (Lasse Fogelstrøm). However, as his life starts to find its feet, Lucas’ world is suddenly torn apart when Klara (Annika Wedderkopp), a young girl and daughter of his best friend (Thomas Bo Larsen), accuses him of paedophilia. Directed and co-written by Danish filmmaker Thomas Vinterberg, The Hunt takes its viewers on an intense trip through Lucas’ turmoil at the hands of a mere accusation by a girl too young to understand the repercussions a seemingly simple statement can have. From the brief moments of quiet suffering to the bolder emotional outbursts, Vinterberg and co-writer Tobias Lindholm expose every inch of Lucas’ fragile self and unsettled mind, carving a tense and powerful portrait of a man whose life is shattered instantaneously. What makes The Hunt more captivating, however, is the accuracy in which the herd mentality is depicted. No sooner has Klara hinted towards Lucas’ supposed wrongdoing than his whole world is ripped right from under his feet, with the hatred of his fellow townspeople denying him of his basic human rights and reducing him to the four walls of his isolated and claustrophobic house, where he’s left to vex. The speed at which Lucas is ostracised is astonishing, and the abuse he’s subjected to is no less than contemptible. Similarly, even though most of the townspeople hatred is irrational and based on somewhat insubstantial claims from Klara, an impressionable and cheeky child with a wickedly vivid imagination, that doesn’t mean their malice towards Lucas is entirely unwarranted, as most of their responses are as primitive as they come. That, in addition to the fact that there’s always a certain level of ambiguity to Lucas’ virtue even though it’s made soundly clear how innocent he is from the start, makes the film all the more chilling and unsettling. Vinterberg roots the film in the changing of the seasons, from Autumn to Winter, which beautifully accentuates Lucas’ increasing isolation and abandonment. 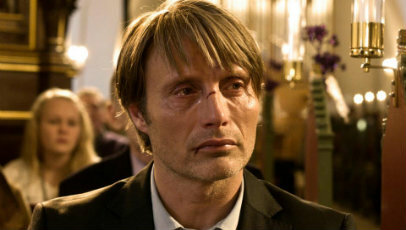 His indictment comes at a time when communities should be banding together, not forcing themselves apart, and Vinterberg uses this to his strength in several pivotal scenes – one of which taking place at a Christmas Eve church service when Lucas reaches breaking point and lashes out at his best friend for not trusting the innocence in his eyes. It’s the lead performance delivered by Mikkelson, however, that fundamentally validates The Hunt’s smarts. He plays Lucas with such humility and heart-breaking veracity that enables the various effects the accusation has on his very being feel entirely authentic and unmerited. The supporting cast provide decent support, with Larsen, Fogelstrøm and even Wedderkopp as Klara embodying their respective characters with the necessary range of emotions and anxiety to maintain the forever percolating atmosphere. The Hunt is an unnerving and haunting look at how quickly and intensely an innocent, well-loved and compassionate man’s world can be turned upside down when a feeble-minded accusation is made against him. Mikkelson stuns with a full-bodied and deeply layered performance, while Vinterberg handles the reigns with a remarkable – and commendably unbiased – focus. It’s in many ways the follow-up to the his stand-out family fallout piece Festen we’ve all been longing for. This is due for release in February over here; I can hardly wait! It’s well worth the wait!